I’ll be honest, I’m having a really hard time writing this post. I’ve blogged about my experiences with chronic illness a little in the past, but I’ve been wanting to share more because I think it’s important. I know chronic illness is something many other multipods struggle with. 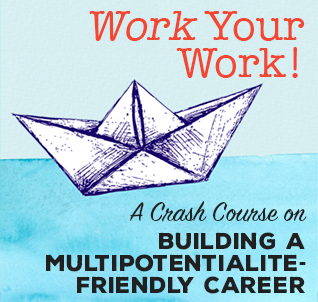 As the “resident multipotentialite” here at Puttylike and someone many people look to for answers, I try to share my vulnerabilities and struggles, too. The thing is I don’t really like talking about my health problems in real life. Talking about it usually makes me think about it more, which makes me obsess about it in an unhelpful way. Also, people just looove to offer suggestions when they don’t know what they’re talking about. Even having dietary restrictions causes some people to react in strange ways. I have one friend who expresses her shock (and disappointment?) anytime she sees me eating a paleo-friendly sweet or something like grain-free pizza. It’s as though she has labelled me “the sick one who can’t eat anything tasty” in her mind, and whenever I challenge that idea, she gets upset. People can be really weird about food. Anyway, point is, I don’t talk much about my health problems in “real life.” However, since our brave Puttytribe members have opened up about their experiences, and part of me actually really wants to share with you, I’m going to get into it. You don’t need to know the details of my roughly ten-year medical journey. It involves: gut infections and some autoimmune stuff. It currently looks like: abdominal pain and distension, insomnia, anxiety, fatigue, and brain fog. I don’t experience these symptoms every day, but maybe three to four days a week, in varying intensities. Often it’s quite mild, but there are days when I can’t focus on anything because my head feels like it’s stuffed with cotton. Just this morning, I got up for a meeting and then went back to sleep for two hours because I just had zero energy. I keep a heating pad by my bed because I’m so used to having stomach pain in the middle of the night. My symptoms have gotten better over time, as I’ve addressed the root causes, modified my diet, etc. But it’s still an annoyance that gets in the way of my ability to focus and function. 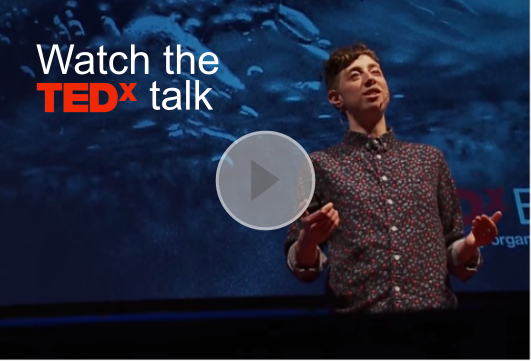 Did you know that the night before my TED talk I barely slept? It wasn’t just nerves; it was also pain. I took like three baths at the hotel in the middle of the night, praying I would feel better and fall asleep soon, trying not to freak out. In the end, I just told myself I’d be as gentle with myself as possible throughout the day. I would made sure to eat food I knew I tolerated well and do my pre-presentation rituals like meditation and power-posing. I figured that, even if I was exhausted, it would be okay. All I needed to do was be “on” for twelve minutes. I could manage that. Part of the reason I’m sharing this is that it’s really easy to compare your insides to other people’s outsides (as the saying goes). People often come across my TED talk or online presence and assume I’m this super passionate, productive person all the time. That’s just not true, and it’s okay. You don’t need to be “on” or “bulletproof” or “superhuman” to pursue your passions and make a difference in the world. So, here’s the part where I give you my X best tips for dealing with chronic illness. But honestly, I don’t have much to add to the wonderful suggestions our puttypeep shared last week. The main thing that has helped me is just becoming okay with lowering my daily expectations for myself. I pay attention to my ebbs and flows. When I have energy, I try to do something important and creatively challenging. When I feel like crap, I do admin, answer emails, or do nothing at all. The reason I love this quote so much is that I’ve really found it to be true. I might not get much done in a single day, but over time the small actions add up. A huge source of emotional pain for me used to be getting to the end of my day with a dozen things left on my to-do list. But I’ve found that if I lower my expectations for what I’m going to accomplish each day, and really just put one to three things on my list, I feel much better about myself. Lowering my expectations for myself is hard to do and I don’t always succeed at it, but it’s something I’ve been working on and have found really helpful. Thanks, my multipod friends, for being good listeners (or readers, I suppose). Feel free to share your thoughts and experiences in the comments below. Thanks for being vulnerable and sharing. That is not an easy thing to navigate. I have struggled with multiple chronic illnesses but the most painful being migraines. I have addressed all triggers and they have slowed immensely. I agree that you have to have two different sets of to-do lists. Meditation and Reiki have helped me. I have also found that being self-employed has made the situation much more tolerable because I can often rest when I need to and rearrange things easier than when I had a traditional job. Here’s to coping and banishing pain! Thanks for this post. My daughter and I both have fibromyalgia and gluten intolerance. She has other chronic pain issues as well. From the outside, people think we have it all together and are what they see as “normal” … it’s anything BUT that! As you mentioned, moderation is the key to getting things done … and tapping in to the wisdom of knowing our body and what we can and can’t do on any given day, knowing the triggers (weather can be a biggie), and being gentle with ourselves when the going gets tough. Thank you for helping other people be aware. It does make a difference. Thank you for sharing this, I can sense how much it cost you and I think your perspective is really helpful! Keep going!!! Words can not fully express what I felt when I read your blog today. That being said, I still would like to say, “thank you” for sharing your weaknesses and health challenges and this has helped me to learn how to better deal my issues. Again, thank you very much for your wonderful articles, and for helping to put together this organization of like-minded people who share a love and passion for living. It is so refreshing. Thank you for addressing this! I often look at people living their busy lives and am flabbergasted that they have the energy to keep going. I forget not everyone lives in constant exhaustion. I still struggle with guilt because I have never been able to hold down a “real” job, but I manage to contribute plenty to society even without the formal structure of a career. I also remember that lots of creatives tend to work as I do – in fits and starts with lots of down time for ideas to percolate. I’m always encouraged to read about others who don’t fit the go-go-go mold that society has deemed normal. Kaci, you are not alone. I’ve had chronic health conditions all my life, and came down with ME in 1985, so I’ve never been a well adult. When there’s so much emphasis on being economically productive, there’s a great deal of pressure on those of us whose day to day (or even minute to minute) symptoms make it impossible to have solid plans – people don’t seem to realise that we’re in very dysfunctional and unsustainable cultural patterns. Perhaps those of us who simply cannot fit into those patterns can serve the function of pointing out that the patterns ARE the problem. Even the fittest, most energetic people are adversely affected by social inequality and the emphasis on making a few people rich at the expense of everyone’s physical, mental, and emotional health (including those at the top of the heap). Could it be that we have something important to teach the rest of society about what is important? : Self-care, community care, Earth care, the freedom that results from understanding our own boundaries, inclusivity, focusing on what brings deep contentment rather than the immediate gratification of whims and caprices, supporting each other in our flows and ebbs, valuing ourselves and each other for our innate worth instead of what we’re economically worth to someone else? Thank you for sharing your vulnerability! Have you ever tried fasting / intermittent fasting / water fasting? It has helped me a lot (general health & fitness) and many people claim theyve healed all sorts of diseases by fasting (especially water fasting). Thank you, Emilie. Very helpful post. Reminds me that I, like many of us, suffer from a chronic illness called self-judgment. I’m not being glib when I say that. I realize how much energy it saps to be constantly critiquing my progress. Thank you for the reminder to allow for lower expectations on occasion. Thanks so much for sharing as I am new to the community. I came across your blogs after trying to figure out what was “wrong with me?” Why I have degrees and seem successful at whatever job/career I try, but quickly get bored and want to move on to the next challenge or creative venture. Truth be told; I just turned another letter of resignation in after over a year as a Director of a Dept. in Higher Ed. However; per this blog, I too have a chronic illness. I have AS (made more popular by the frontman of Imagine Dragons having the same disease). It causes a lot of back, hip, & knee pain; even eye inflammation. All that pain can lead to fatigue. I also get tired of hearing how well-meaning friends and family always seem to have the “cure” or the right “diet” for me. I mean I’ve tried everything! So thank you for sharing, I had no idea you had these issues Emily, and it makes me feel like I still can accomplish a lot. Celiac? I feel you, Emilie. Thanks for this post. You’re such a rockstar; thank you for being brave and sharing your story with this community. I want to say so much more than thank you but I’m struggling to find the right words to capture how much I needed to read this post today. You’re making such a large impact in this world – keep on being you! Thank you for sharing this Emilie. You had intimated in other writings but I know it’s a whole other thing to lay it bare like this. I live with anxiety and though I do share that in a few words, I haven’t yet written a post to give more of a story (though I have thought about it). It’s not easy to share these things but it can inspire people to open up about their/our own vulnerabilities. ? Whoops! There wasn’t supposed to be a question mark there. Thanks so much for sharing this. Just this year I started opening up about my 40 odd year long battle with depression and anxiety. I even write in my blog about it once in a while. For a very long time I had been exhausting myself by trying to keep up with a 40-50 hrs office job. Beating myself up that everybody else seems to be able to easily do it, why not me? Only this year I finally understood that constantly fighting my emotional overload also tires out my body. Due to my mental illness I am much more susceptible to stress. This means that the stress system of my body quickly gets into overdrive. Which leads to exhaustion and other illnesses. I now try to take more care of myself. But I still struggle with accepting that I have bad days where I don’t get much done. I still fight feeling lazy and guilty that I don’t put as much in a day as my husband. I only start understanding it is not my fault. That a mental illness can be just as exhausting as a physical one. My heart is with you. Experienced nearly the same. Be gently and loving with yourself. You can be as slow or fast as you are, and it is ok. The only thing what you have to do on bad days is keep breathing. Nothing more. And this is ok.
That means that some people can have a low stress tolerance and need more time for regeneration. Btw 2: Even if you have someone has a COMT mutation, you can do things (nutricion, sports, therapy) that you can deal with it very well. I have this, and it’s not defacing. I just need to ride and handle my waves. I can be punctually be very fast and productive, for a view hours or days, when necessary. Then I need more rest than some other people. When not necessary I try to soften that waves by doing the work in my tempo and rythm, try to do it how and when I want and doing everything very unhurried and without pressure. I try to avoid factors which stress me. Of course that is not always possible, but that “not always” has very low impact. Thank you for opening up and sharing. I’ve got IBS (C) and it’s amazing at how many people tell me if you’d try XYZ, you’ll be better. I, too, feel times of guilt and my husband says take it easy. I reply I can’t because I’ve got to do this and this, oh, and the toddler needs this. At the moment, I don’t know what my passions are. Thank you Emilie for sharing this thoughts and feelings! I was feeling bad today for not being able to do much. I just hurt my back, I am not sure how bad yet, but I hope this to be temporary. I thought that I need to be strong and accept that the pain is there. I know other people who deal with it permanently. After reading your post, I will accept that I can’t do it all sometimes and do whatever I can when the pain is less intense. Your words inspired me and I admire you for all the awesome things you do. I wish you the best. Today you helped me so much with your post. I had a big energy problem, also different issiues in different bodyparts and that foggy brain. I sometimes was afraid that I “loose” my brain and am not able to think anymore. In bad times I thought I wouldn’t survive this night. No I’m nearly up the most time. I have some days where I can not be the super version of myselfe, but this is ok. I’m so glad that this brain fog is away and that I don’t need to be afraid anymore and that I don’t need to lay down during the day. For me the solution was and is: Nutrition. And I mean not any kind of, but choosen nutrition based on blood and gut test results. WARNUNG: Just read further if you want to have tips. I know that this doesn’t count for a lot of persons. And I know that all people has “clever” tips to get healhier (which didn’t help me at all). But I just have to say the following. Perhaps if one person got help through this post, it is worth it. After a long journey (3 years) through doctors and a lot of unnice inspections I found my personal Gold-Nugget-Doctor. He found the problem. And he solved it with the right(!) nutrition. A good doctor who’s into orthomolecular medicin or functional medicin knows what to check. 2. In bad days you have just keep breathing. 3. In view of the universe that issiue (getting something ready, be on time, cleaning up, looking good, etc. …. )is unimportant. All the best. My heart is with you!! Thanks for sharing your vulnerability with us Emilie. I read the article on ebbs and flows a few months ago and it completely changed the way I deal with my lately health issues. I don’t feel guilty about habint « downs » anymore and I use my time more efficiently. 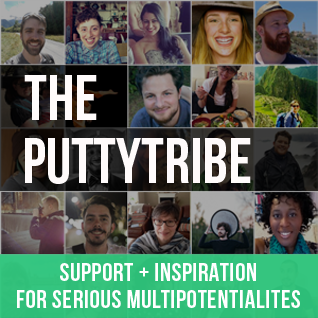 Actually, I think that discovering PuttyTribe is one of the best thing that could happen in my life!! I finaly feel understood!! Thanks again for everything you do! It’s not easy to share something like chronic illness with anyone. Especially if you don’t “look sick.” People can become critical of everything. You are still a very inspiring person for all you do. 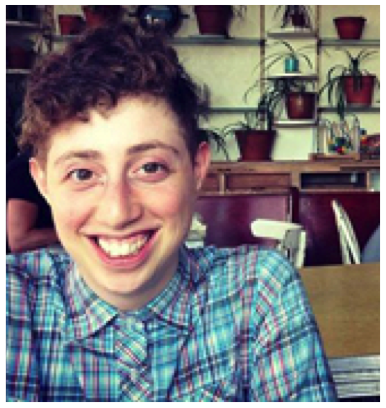 I have PCOS – Polycystic Ovarian Syndrome. There’s finally a lot more attention given it, because of women with drive like you who have done the research, went through the trial and errors of easing symptoms, and badgered the medical community to address it. I give them so much credit too. But it leaves you feeling so many ways, including mild depression, and I hate the brain fog and fatigue. Thank you for the tips, accomplishing at least 1 thing on the to-do list is better than nothing. If I’m able, I tend to poke at it throughout the day, rather than use up all this energy and struggle to finish it in a set time. Fellow PCOSer! It’s astonishing how widespread this condition is, and how the range of symptoms – from indescribably excruciating pain to potential heart and insulin problems to fatigue and depression – are largely unknown to family doctors. I’ve only had it addressed in terms of fertility by doctors, and have had to research it myself. The problem of being judged by others when you have an invisible illness/disability is enormous. When people say, “You don’t look ill”, I’ve taken to forcing a smile and saying, “You only see me when I’m well enough to leave the house.” We live in a culture that is largely ignorant of chronic illness and disability, and which fosters suspicion of anyone not able to/prepared to drive themselves flat out all day every day to perform at 100% economic efficiency. It’s not healthy for anyone, and people with disabilities and/or chronic illnesses are like canaries in the coalmine for that toxic attitude. It’s bad for everyone, and it fosters that suspicious feeling that someone’s trying to rip you off – and it’s always people who need a bit of extra help or leeway who bear the brunt of that suspicion. It helps to remember that you’re not doing anything wrong; it’s the patterns we’re stuck in collectively that are messed up. Hi Emilie! I just wanted to say that I hear you and really appreciate you creating a space where everyone can feel comfortable sharing their experiences and thank everyone in the comments for sharing! I’m sorry to be one of those people who offers suggestions, but read the Medical Medium, Secrets Behind Chronic & Mystery Illness & How to finally heal. Everything you, and many of those who commented below, describe was me … for years. Pain, insomnia, digestive issues, hot flashes, PCOS. I wouldn’t have bothered reading a book with the word medium in it if I hadn’t been prescribed the diet first by a dietician and later found out the source. But after four years on a high-fat paleo diet that I was told would help – and it did, at first – I was even sicker. Now, after less than a year, I’m finally healing. There’s so much health misinformation out there, I know it’s hard to know what’s what. But just try it. You won’t be sorry. I thoroughly enjoy this site and wish you good health and happiness Emilie! Emilie, thank you for sharing your journey. I/ we enjoy every post and can’t thank you enough for your equal parts honesty and optimism. I volunteer for a workforce recruitment program for college students and recent grads who qualify for schedule A hiring authority (schedule A is a federal government hiring authority for those requiring reasonable accommodations to succeed in the workplace). I frequently hear the students describe themselves in terms of their limitations. I remind that I’m not here to assess impairment only to rate their ability to work as I would any other candidate. I allow them to tell me whatever they are comfortable in sharing. I then remind each of them that he/ she is a continually evolving, dynamic, growing person who at this point in life is a college student majoring in X at Y university. Some leave the interviews with a greater sense of self. I usually leave humbled. Thank you and the Tribe for doing what you do. You never know how your posts and teachings extend beyond the Tribe expanding our knowledge and helping others achieve their goals and purpose. Hi Emilie, I really appreciate that you opened to us on such a personal topic, and want to thank you for sharing your experience and tips. Since I found this community, I’ve learned to accept myself (with all my multipotentiality), redefine my directions in life, and work everyday to achieve something meaningful! My experience has been with cronic insomnia for pretty much all my life. I used to be very hard on myself for not being able to keep up with my everyday expectations because of this, but today you gave me a great life lesson. Thanks again and stay awesome!! Thank you you for being open and letting others know they can be imperfect and still get things done. Thank you so much for sharing. At the height of my own health issues is when I joined the PuttyTribe, I know that helped to keep me going. I love your coping suggestions, they are simple and relatable. This is fantastic, both in the sharing / vulnerability of personal experience and in the support of suggestions that can only come from people who have struggled in these ways. Sharing of our stories in an honest way helps us to heal ourselves and also to heal one another to some degree. We open up and hold a space for each other. This seems to be frowned upon in “real life culture”, and though vulnerable sharing goes much deeper than culture might like, I think we lose something really important when we keep our truths hidden. Thank you (all) for your courage, empathy, and multi-pod-ed-ness! I really didn’t think chronic illness might be connected to multi-potentialism, but it seems like it might be. I too have suffered chronic pain most of my life and was diagnosed with fibromyalgia about 20 years ago. The pain is mostly gone but I can tell when my pain is fibromyalgia. I actually can say that my illnesses are as multipotential as I am! I have ocd adhd depression anxiety addiction, and I think that’s it. I’m in recovery and seeking help for all of it. But I still feel anxiety and fogged brain if I get bored at work (or just in the morning). That’s my adhd. Or? I thought I would jump out of my skin in the office yesterday. It’s hard to find anyone who understands. Your Ted talk, blog, and now this post have all helped piece it together. Thank you for sharing a difficult part of your life. I still long to find work that brings joy to my life – so I’ll visiting your site often. Thanks again. Thanks very much Emily for sharing with us. I have been diagnosed a year ago with an acoustic neuroma. This year is been the hardest of my life but I am learning so many things about life, myself and so on. I was in need to share my feelings so I have created a blog. Now is just a place where I put my feelings and is in spanish as I am spaniard, that´s the reason of my weak english. I invite you to read it if you feel so. Maybe in the future I will be able to translate. Cheer up! We can do it! Boy can I relate, I have a genetic condition that results in physical pain and lack of energy. These ebb and low as you stated, some days are awesome, some I wonder if I will just get through them. I am with everyone here it seems…thank you for sharing your struggles with us. Hearing a “me too” goes a long way in creating community and helping others to feel not so alone. I too struggle with chronic health conditions and for the most part have them in a nice balance after many years of struggle. What has unfortunately developed though is a paranoia over what happens when I have a bad day or if I eat or do something to trigger a flare(I have Hashimoto’s). Once I get into a flare situation it usually takes a week or more to manage it and get myself back to a precarious balance. During the flare I am useless. All productivity goes out the window and I feel like a schmuck. It is hard to tell people why you aren’t able to deliver during this time because they can’t often see what is making you sick. Society is not built for people who need consideration in these areas but the more we talk about it and accept it in ourselves, maybe others will too. Our worth is not in what we produce, but who we are. This was a very inspiring post Emilie. I have not had to experience chronic illness, but I had had issues with “comparing my insides to others outsides” and focusing on being “overproduvtive in a day and under productive in a year.” This has really helped me gain a new perspective that will help me to accomplish my long-term goals. I was amazed to read that you barely slept before your TED talk. I couldn’t tell at all. Oh and by the way, did you know that Liberty University uses your TED talk as part of its curriculum for a class called INDS 400? It was my capstone course for my B.S. in Interdisciplinary Studies. That is how I first heard about you about a year ago. I figure that may be inspiring for you to know if you don’t already. You have helped me so much to figure my life out and to realize that I’m not broken because I have many talents and interests, have had a lot of jobs, and have changed my mind about what I want to do for my career a lot. Your site has been a huge help and I am reading your book now, which is helping me even more to build a career involving all of my passions. I will pray for your continued strength and growth as you do great things despite your illness. These things can be tough to share, especially, like you said, because everyone has this urge to FIX IT. Thank you for offering your experiences and your wisdom anyway! My partner’s got a few chronic health issues–some long-standing and some pretty recently cropped up–and the whole “ebb and flow” mental model helped them IMMENSELY to feel less frustrated and helpless on hard days. (Shoutout to Neil Hughes for sharing that concept with the Puttytribe!) And for myself and my occasional brain fog/fatigue days, it’s a comfort, too. Fantastic post – really enjoyed it. The apologies I get every time we go to a restaurant or the embarrassment some feel when I have to ask so many questions of the waiter. It doesn’t bother me or the waiter yet it bothers the people it has no effect on at all. The countless times I’ve heard, “Can’t you just take a probiotic?” I take a deep breath and carry on. This hasn’t “fixed” me but it does help manage the symptoms. It’s like a massage for your organs, at least it is more for me as that’s where my issues are. You stay fully dressed while they work. I can go during a flare up and come out much improved. Just wanted others to know it exists. Being understanding and nice to ourselves is important and we have to remind ourselves of this all the time. Our world is so work and production driven. We aren’t machines. It’s good to allow ourselves that space to be human. Thanks for sharing your struggles here. I also have autoimmune issues. And I don’t like to talk about them, either. I have to bring it up when there’s food involved, but still, I give as little explanation as possible. I felt immensely relieved when I finally found out why I felt so crummy–it took years! And I feel better a lot of the time, with changes in diet and lifestyle. But I still often don’t feel great. I struggle with all the things I want to do and my energy or lack thereof. There are days when I go like gangbusters, and others when I barely do anything. Sometimes I’m at peace with how things are and other times I feel really frustrated. But I’m learning to take it all in stride. I’m creating a life that I love because, at least partly, of my health challenges. And I’m learning to be ok with not always loving everything about my life–not always feeling like I have to be cheerful and upbeat, but that’s still hard for me. Anyhow–I appreciate your sharing your own struggle. Thanks! 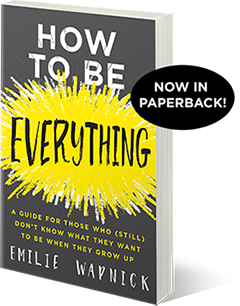 Some of your common-sense approaches in dealing with the pain are spot-on for me, as well, Emilie. I found two heating pads to be most helpful. Both on High, one on top and one underneath. I took 7 or 8 hot baths a day. By laying on my side in very warm water and allowing hot water to drizzle in for 20 minutes or so, I was able to manage the pain without medication. I eventually had to have surgery, though, that was misdiagnosed as a fibroid tumor. Also, although I bought the book, “Eat Right 4 Your Type” by D’Adamo / Whitney, more than 20 years ago, I went on the diet in March and my chronic inflammation is receding so much so that my doctor even noticed. I’m feeling better than ever. Maybe it would help you, too! Thank you so much for sharing!!!! I have a chronic illness as well (HPA Axis dysfunction) and for part of my life it was REALLY bad (manifesting in bulimia) that was a long time ago, it’s way better now but it’s still really really hard and I learn more all the time about what my limits are, and sometimes it just makes me break down sobbing because my expectations of myself are so high but like you said some days the body just is tired or crashes. Literally today I was realizing “Hey, I don’t HAVE to live in a city……” because I’m finding it so exhausting to keep up with life. Little things like having to ask every new coffee shop the ingredients in their almond milk, and then realizing it would be better for my health condition not to even regularly GO to coffee shops, except I feel like I have to to get work done because I’m in a city and that’s what the vibe is (and no, tea is no fun AT A COFFEE SHOP nor is plain decaf coffee when you’re used to drinking lattes, hehe), and then I was like but wait, I could **not** live in a city, and have a nice enough home I was happy working from home, and how much stress would that take off!? Thank you for sharing!! !